NASCAR’s second trip of the season to Michigan was an eventful one — from talks of sandbagging, to the age-old “team orders” discussion, to a busy week for Kyle Larson. How’d we feel about it? Well, there are always thumbs up and thumbs down. On Sunday, Larson notched his third win of the season, and the fourth of his young career. His four race wins have come at Michigan, Auto Club Speedway, Michigan, and Michigan. That means every single one of Larson’s wins, dating back to this very race a year ago where he scored his first victory, have come at 2-mile, D-shaped ovals. Since we’re done with 2-mile D-shaped ovals for the season, that means Larson has had a total monopoly on wins at such race tracks from August 28, 2016 until at least March 18, 2018 when NASCAR returns to Auto Club Speedway, the next 2-mile, D-shaped oval. While we know Larson is an uber-talent, he gets a thumbs up for being really good at one thing — winning races on 2-mile, D-shaped ovals, apparently. It looked like Sunday’s race might have been Martin Truex Jr.’s to lose as he won Stage 2 and led late in the race. Unfortunately for Truex, as the story’s gone many times before, he wasn’t able to score the victory. If he’d done it, it would have been the first time in his 428-race career that he’d won back to back races, having picked up his fourth win of the season at Watkins Glen. Thumbs down for the feeling of expecting a victory, only for it to get swept away. At least Truex has a lot of playoff points. It took a little convincing from fans on social media, but Larson’s team owner, Chip Ganassi, allowed him to compete in the Knoxville Nationals main event Saturday night. Larson ended up placing second in the prestigious sprint car race — but, of course, earned the victory in his day job Sunday at Michigan. 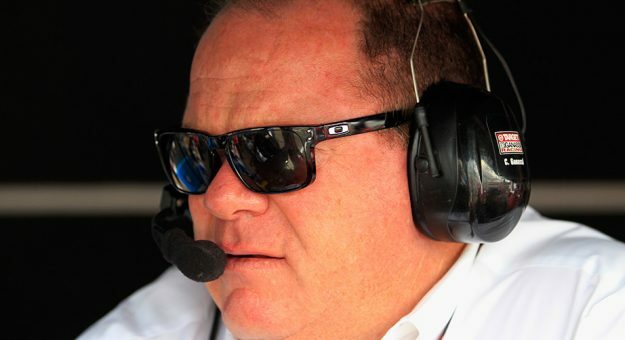 Thumbs up to Ganassi for being a good boss. Of course, while we call Ganassi a good boss, he also showed a bit of aggression this weekend — in a good away, at least — after Larson’s No. 42 took the checkers. …but to nearly shaking the lights out of his crew chief in excitement. Thumbs down for being a little too excited. Larson’s earning a lot of thumbs up this week and all for good reason. But one of the most impressive parts of his victory was that he didn’t lead any laps during the 200 scheduled laps of the race. After a restart in overtime, Larson made a bold move to the lead, holding on for the race’s final two laps: Laps 201 and 202. A major thumbs up for being so clutch in closing out the race that you don’t even lead any laps in the scheduled distance of the event.